Summer is finally here! It’s time to hit the road and knock some beautiful places off your bucket list. Even though it’s often cheaper to drive than to fly, it can get pricey and stressful to stay in hotels on top of paying for gas, food and entry fees at the awesome places you want to visit. But for just $80, you can get a pass that gets you into every national park in the United States all year long, and you can camp for free or dirt-cheap at most of them, too. A couple of months ago, a Google map of a road trip visiting all lower 48 states went viral. You probably remember seeing the crazy route that weaved all over the place to stop at at a key destination in every state, but the trip missed some of the best national parks. Here’s just one way you can see some of the country’s most spectacular parks on a shorter trip. It’s still almost 3,500 miles and 59 hours of driving, but the views between them all definitely won’t disappoint. Ready for an epic summer road trip? It doesn’t really matter where you start since this is a loop, but for this trip I’ve started at Rocky Mountain National Park because it’s just an hour and a half from the Denver International Airport. Travel times are from entrance to entrance, according to Google Maps. Expect a lot of slow, curvy mountain roads and, on busy days, long lines to get in. That’s another bonus of an annual pass: At some parks, like Rocky Mountain, pass holders can go through an expedited line. Enjoy stunning views of the Rockies from the road or from the trail. The park has the highest continuous paved road in the United States, topping out over 12,000 feet. Entry fees are normally $20 for a passenger vehicle for one week — but since you have your pass, you’ll get in for free. Your accommodation costs depend where you want to sleep. Car-accessible campsites range from $3 to $20 per night. Backcountry camping requires a permit and a $26 Wilderness Administrative Fee. 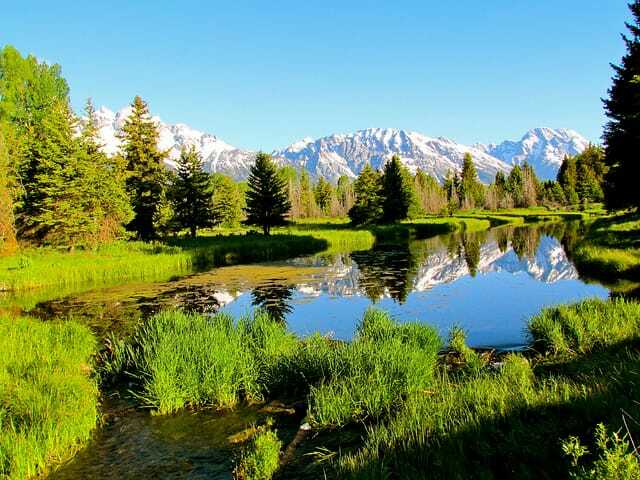 You’ve definitely heard of Yellowstone, but Wyoming’s lesser-known Grand Teton is arguably even more beautiful. The sharp, breathtaking mountains are probably unlike any others you’ve ever seen. Camping in the backcountry requires a $25 permit, and staying at the campgrounds costs $22 per night. Without a parks pass, it would cost $30 per vehicle to get into the park. Yellowstone spans three states and is home to the famous Old Faithful and a large collection of other geysers. It’s a popular destination and parts of the park can get very crowded. Entry costs $30 per vehicle if you don’t have a pass. Campground fees range from $15 to $46.75 per night, or you can camp in the backcountry with a permit for $3 per night, per person. Expect to be awestruck as you explore valleys carved by glaciers and get glimpses of some of the 130 lakes within the park. Camping at Glacier costs $10 to $23 per night during the summer. Backcountry camping is $5 per person, per night, and there’s a $30 advance reservation fee. You don’t have to pay that if you request a permit less than a day before you plan to camp. Without a parks pass, getting into the park would cost you $15 in the winter and $25 in the summer. Mount Rainier is the highest peak in the Cascades, and it’s also an active volcano. To camp in the backcountry, you’ll need a wilderness permit. It costs $20 for a reservation — you’ll need to make one in advance — and it’s good for camping for up to two weeks. Camping at one of the park’s drive-in campgrounds costs $12-15 per night. Without a parks pass, it’s $20 per vehicle to enter the park. Where else can you find an impossibly blue lake confined to a crater 2,000 feet deep? In warm months, the park offers swimming, fishing and boat tours. Camp for $10 to $22 per night. Without a pass, it costs $15 to get into the park. Camp under the open sky and you’ll be treated to some of the best stargazing you can find. The delicate, ancient arches never cease to be stunning. Camping in the park costs $20 per night, but reservations book up quickly during busy months. Plan ahead. Limited free backpacking permits are available at the visitor center. Without a pass, it costs $10 per vehicle to get in. Travel to Black Canyon: Two hours, 59 minutes; 180 miles. It’s not as big as the Grand Canyon, but Black Canyon is extremely underrated. Most people take it in from either the north or south rims, because there aren’t any developed or maintained trails down to the river, but if you have the time and are in good shape, you won’t regret hiking down to the bottom. The park has limited wilderness permits available, so arrive early if you want one. The permits are free and allow you to camp at the river. Without a pass, it costs $15 per car to get into the park, and campsites range from $12 to $18 per night. The Sand Dunes are, hands down, one of my favorite places in the entire world. Climb up massive piles of sand hundreds of feet tall and then run, jump or sled back down them. In the spring and summer, snowmelt from the surrounding mountains forms chilly Medano Creek. Stay in the campground for $20 per night, or hike past the closest dunes and camp in the sand for free. A free backcountry permit is required. Without a parks pass, it costs $3 per adult age 16 and over to enter the park. Will You Try This Road Trip? Depending on how long you want to camp and how much time you want to spend between long legs of driving, plan to dedicate at least two weeks to this trip. That gives you an average of four hours in the car every day, and a little bit of flexibility to spend more time where you want to. But it’s your trip! Feel free to modify it as much as you want. You can play around with the destinations on the map I created here. There are so many cool places to visit between all the destinations, and the towns outside the parks are great, too. Without a parks pass, it would cost $168 to visit all of these beautiful places this summer, so you save $88 with an annual pass. Bonus? You can keep using it for the rest of the year. To find more parks near you, check out this map of national parks around the country. For more ways to make the trip even cheaper, check out these money-saving road trip tips. Your Turn: Have you ever bought the national parks annual pass? Where did you go? Kassondra Cloos is a reporter in Colorado Springs, Colo. She’s been to more national parks than she can count, but still can’t get enough.